Say what you will about the online antics of Ashley Rouston (A.K.A. The Beer Wench), but you can’t argue with her success or her work ethic – the girl is all hustle and knows how to play the game. She’s long been out front on the craft beer social media scene and has worked it and worked it to develop close relationships with brewers and other leading voices in the craft beer world. Now all of that hard work seems to be paying off, as she has landed a sweet gig that takes her from self-proclaimed craft beer evangelist to legitimate craft beer expert. Like it or not, The Beer Wench is becoming the new face of craft beer. I think this is a very cool idea and Ashley has definitely struggled to get this opportunity and I hope that it’s a success. What’s good for craft beer is good for us all. ← In Alaska, Beer is Survival! I hate to be Donny Downer, but this might lead to over imbibing. That is 4 pretty big beers in an hour, as well as the free for all at the end. Cool concept, but too much IMO. It’s cool just to hear about the beers and interact with the brewers. You don’t have to drink along, but you might decide that one of them sounds great to you. Or you could be like me and exercise NO self control and drink a sixer for each tasting! OK, Grandpa. 1) Those beers aren’t that big. 2) It’s online, so folks can drink at home. 3) Just because your tasting beer doesn’t mean you have to drink all of each bottle. Pour a little, share some, and finish it off later over a long period of time. We aren’t talking full pints, just samples Donny. I’d assume. I’ve gotten on twitter, but its almost too much social networking for me, I like the being outdoors to much to be available 24/7…oh and I’d be divorced. I am assuming that most of these “samples” will be 12 oz beers for most people. I don’t know about you, but that would get me pretty messed up. ya know, I realize there are a lot of wrinkles to iron in shipping beer, but the wine industry has been doing something like this (and even better) for quite some time now. There’s a website called Taste Live and when there is an event, several wines are sent to a group of bloggers who then log on at the same time to taste/review/discuss the wines. Usually the winemakers are there chatting as well. All of it posts to our Twitter accounts. If the beer industry could get through the shipping hurdles it deals with, it could be taking advantage of this platform too….that way it’s not just the Wench tasting beers and tweeting about them, it’s a group of beer bloggers saturating the Twitter platform at once. Shipping laws are definitely the biggest hurdle, Katie. There’s a live chat tool called Scribble live blog that I’ve looked into before with similar functions as Taste Live. Wish we could get Firestone Walker in Indy! Just cross the border to Illinois. This is similar yet different from the sounds of it Katie. This will allow anyone to sip and share, where the wine thing was just for bloggers and twitter people who were sent samples. I have done the same for whiskey tastings, and it is fun. This may appeal to a broader audience. We did one of these with Wild Turkey and it was informative and interesting. I’m sure craft beer will catch up with wine in this regard (eventually). Taste Live used to do beer as well. That’s where I first “ran into” Ashley. The coordination was always difficult, as many times beers were only available in certain regions. Many substitutions had to be made. I think shipping the beer to dedicated attendees would be a fantastic idea (now accepting donations! LOL) but there should be an eye toward widespread availability with a backup list of suggestions for substituting the intended beers, that way everyone’s on a similar page and can then note differences as some taste the intended beer and others taste a similar substitute. That’s a good idea, and I bet people following the tweet-up can ask what’s a good alternative to the beer being tasted that they can get in their neck of the woods. I’m sure this is being done to also promote the brands and styles that Whole Foods is selling, but in order to ensure a successful event they should be going beyond that to provide wider-available beers with similar profiles. Yes, we can tweet up alternatives but a pre-supplied list of alternatives would condense the tasting somewhat to a select few per style. It’d keep things a bit more focused, rather than having some people reviewing Snow Day and others jumping in with completely unrelated beers. This is a pretty conservative 4 beer tasting compared to what my local liquor store does every Monday for a complimentary tasting. They had Goose Island come in one night and in a two hour window, Sofie, Matilda, Pere Jacques, Night Stalker, BCS, Christmas Ale, 312, Nut Brown, etc….. I think Whole Foods will do a good job being a responsible partner for this. Bah-humbug, Don. My point is that at your beer tasting, your store can control the amount of the pour. This is kind of “on your own” tasting. Hell people could be drinking growlers for all they know. Just saying, even if they only open 12 oz bottles, that could be a bit much. I think the point of the tasting is to educate Whole Foods customers about craft beer and most people following along the twitter tasting will have bought maybe one or two of those included in the line up. I guess I’m just an over-achiever and a pleaser and I would do them ALL! I think you’ve got this right, Tamre. Based on Don’s performance during an online Wild Turkey tasting we participated in, he thinks you have to drink the entire contents of every bottle in front of you. Wow – you WERE hammered! Snow Day and Gingerbread Ale weren’t big beers….I had them both on Saturday night and it wasn’t until many many beers later that I finally “over indulged.” I think those two are good picks. That’s really up to attendees to regulate for themselves though. They could be downing several growlers on their own every night for all we know. But if there’s concern, a “drink responsibly” mention would be in order. Beyond that, all attendees should be adults and therefore should be expected to act accordingly. They are (or should be) grown adults after all. Sounds like fun! I recently “discovered” the ability to get growlers of beer at the Whole Foods near my folks out on LI, and promptly scored a growler of Founders Breakfast Stout to share with my Dad over dinner that night. Good stuff! Unfortunately the Whole Foods in NJ do not seem to participate in the same program (stupid NJ beer laws). Yeah, New Jersey is a mobbed-up throwback of arcane alcohol laws, but at least we get a pretty good bottle selection in these part. So you admit to the existence of “the Mob”? Eyyy! I don’ta know whactchyoo a talkin’ about…. I’ll admit her attention craving online personality rubs me the wrong way, but there is no denying her perseverance and dedication. 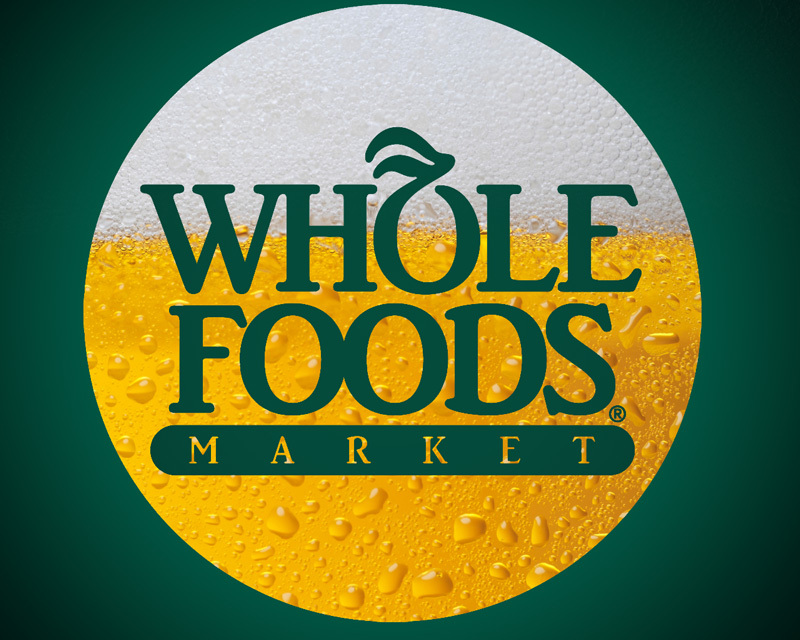 Whole Foods hasn’t gotten the credit it deserves for supporting craft beer so hopefully this elevates their public perception. The Whole Foods near me has a regular stock of Pliny the Elder for crying out loud. I. Agree. With. Every. Word. You. Wrote. I think that’s a first! to quote one of the all-time great theme songs “making your way in the world today, takes everything you got”…more power to her, I’d trade jobs in a heartbeat. It’s a lot harder than it seems. Trying to drink/interact with those there in person/AND tweet quotes from brewers, attendees, yourself….Ashley will have her hands full. Ashley works so hard and she takes a lot of heat. We haven’t always had the best working relationship, but as we both got our feet under us this year, I’ve come to respect and admire what she does. Her approach with her online persona has changed as well. Look at her tweets and posts from two years ago compared to now. Working for Bison Brewing has given her focus and she’s doing something that is envied by many. Cheers to her! I’ll probably play along with the DH Chicory Stout “flight” since that’s the only one I know I can get here. Good to see that there are opportunities for “commercial” success or mainstream notoriety for a craft beer bloggers/tweeters. All it takes is a healthy supply of knuckle grease. It’s been awhile since I’ve had one of those – I always grab the Palo! I should pick up a quad of ’em. BTW, Ashley is one of Ohio State’s finest. Go Bucks! (says the guy who was born in Illinois, and then lived in Wisconsin, Iowa and Michigan). Thanks for the write-up guys! Appreciate the kind words and all the support. And Katie hit the nail on the head bringing up Taste Live, a concept started by some of our friends that I’ve personally had the honor of working with on several occasions. Two years ago I co-hosted the first beer Taste Live with Dogfish Head. Talk about big bottles and big beers…. But, as everyone has commented in this thread, the goal is not to CHUG, but to TASTE. And the value add to hosting it virtually is the interaction people will have with the breweries themselves. It seems like a lot in a short period of time, but 1 hour is just about the attention span for one of these events. And if you think that 4 beers are bad, you should have been at the Wine of Argentina Twitter Taste Live — they sent each of us a case… yes, a CASE of wine. We tasted through 12 bottles. As for me, I am hosting a live in person tasting at the tasting bar in Whole Foods Napa. My buyer is going to put some of the beers on draft… and it is up to the attendees to either share bottles of try to drink a full one. No one is judging. Hope it’s a hit, Ashley. It’s a cool idea and a great way to legitimize craft beer as being foodie-worthy! Yeah, this is a big step, that’s for sure. Ashley, that DFH night was epic. The intent was for my friends to all show up at my place and split the bottles (large bottle of Fort, bomber each of Black & Blue and Red & White, and a 12oz of Palo Santo Marron, IIRC) but that didn’t happen. So, we EACH had that lineup. And being the intelligent sort we are, we tasted just a bit for the event, and then all logged onto Rock Band to play remotely and finish our stashes. Later in the evening, mid-song, a loud crash rang through our headsets followed by “I fell off the drums!” Epic. Truly epic. It’s not a party until someone falls off of the drums! I’m not into Twitter myself…but I say good on her! We eremitic, iconoclastic beer-geeks need another extroverted, media-oriented spokesperson (besides Sam C. that is) to speak up for our interests. I’ve seen her on-line and think she’s got the beer smarts and chutzpah to do it. You can’t argue with chutzpah! Remember when we could share a drink call loneliness, but know it was better than drinking alone? Now, we’ve devolved to a people that shares that same drink while actually being alone. Fantastic. Yeah, and Korg has made the Steinway irrelevant. How’s a piano man to get by?! Wait, your post implies that some people have a beef with the Beer Wench. Maybe I am just too new to the social networking beer scene, but who’s got a beef with the Beer Wench? I think Tamre danced around the answer to that question nicely. I see. Meh. She created a brand. Good for her. I guess haters gonna hate (do the kids still say that?). You’ve got the right takeaway from the whole thing for sure. Yes, haters gonna hate (and yes, I still use that phrase unfortunately more than I wish I had to). From personal experience, when a woman has a very vocal opinion publicly, she’s viewed fairly critically. I’m pressing the like button for comments alone (not that the post itself isn’t a beautiful thing). Yeah, our readers do the best work here, that’s for sure! We Beer Wenches rock it out. Mine was created in service of the company I own and market, The Wolverine STate Brewing Co but she has her own very popular blog and even tee shirts. This sounds like a very clever idea. And I want to try that gingerbread beer!